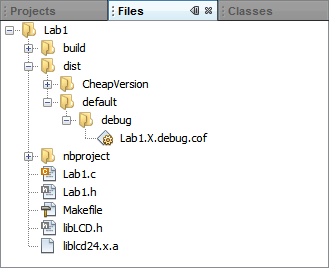 In MPLAB® X, there are two ways to look at the files in your project. In the top left window, there are typically three tabs by default. The first two are used for looking at the files in your project: The Files window (discussed here) and the Projects window. Though they may show similar contents, their behavior and functionality are different. The Files window is a mini-file manager that represents the files and subdirectories of your project directory as they actually are on your hard disk. From this view you can manipulate files and folders much like you would in your file manager (e.g. Windows Explorer, Thunar, Nautilus, Finder, etc.) Just like in your file manager, you can move, rename and even delete files. However, be aware that deleting a file in this view will permanently delete the file. It will not be moved to your system's garbage can/recycling bin. If you delete a file from the Files window, it will be permanently deleted from your hard drive. You will not be able to restore it from the recycle bin. It will be gone forever.